When you order food for the office, your coworkers’ compliments are likely left for the chef. Despite how tough taking care of your team’s appetite can be, it’s a task that’s often overlooked by all those who are eating. We know a little thanks goes a long way, so we’ve set up something special we’re sure you’re going to like. 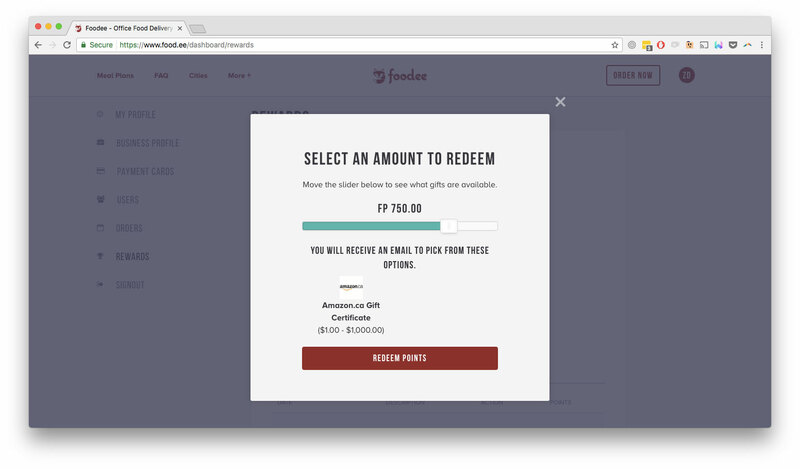 Foodee Rewards is a way for clients to accumulate points which can later be redeemed for online gift cards. 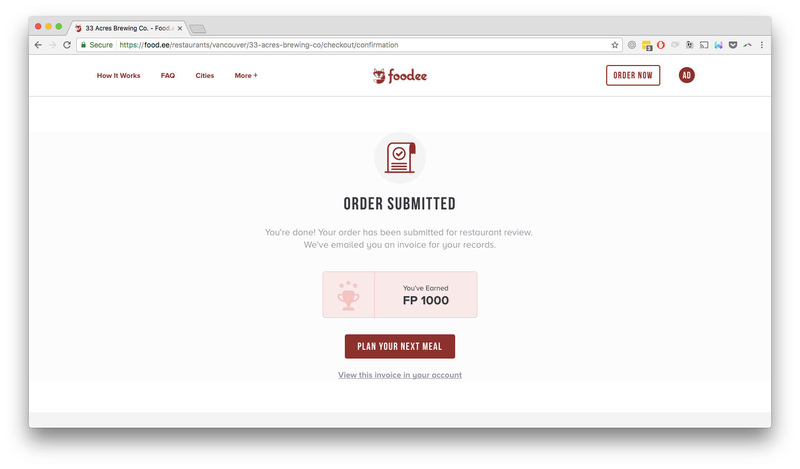 The way it works is simple: when you sign up for Foodee and start ordering, you begin to earn points. Once you have enough points, you can redeem them for online gift cards. To get started, head on over to the Foodee homepage and click on your account in the top righthand corner. 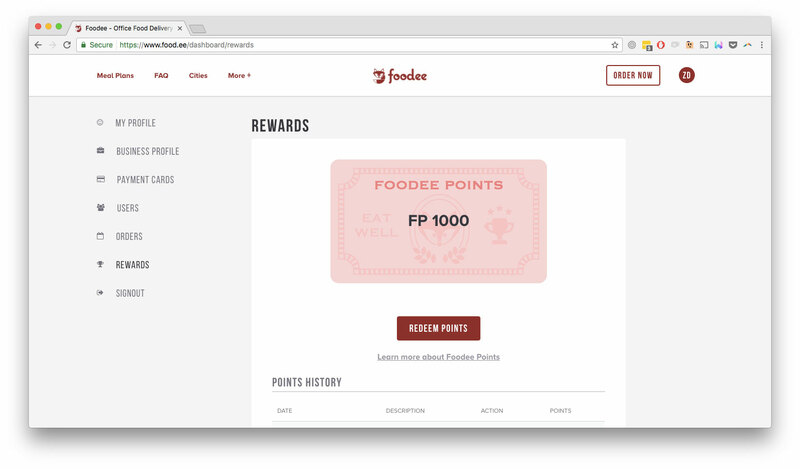 You’ll notice the new “Rewards” section on the left side: click here to find the Foodee Rewards dashboard. This is where you’ll be able to check in on how many Foodee Points you’ve earned, as well as where you’ll trade in your points for online gift cards. For every order you place, you’ll earn a particular amount of Foodee Points. Depending on what Office Meal Plan you are a part of, you will earn a different amount of points per $1. Click here to learn more about Foodee Office Meal Plans. Basic and Pro Meal Plan members will earn one Foodee Point for every $1 they spend. These Meal Plan members must place their orders online to be eligible for Foodee points. Enterprise and Business Meal Plan members will earn two Foodee Points for every $1 they spend. These Meal Plan members may place their orders online or with an account manager to be eligible for Foodee points. Be sure to note that only orders of $100 or more will be eligible to receive Foodee Rewards Points. Team Orders earn Foodee Points the same way regular orders do also. After you’ve submitted your order, the amount of Foodee Points you will earn for that order will appear. 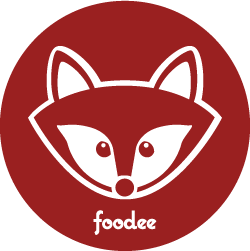 It’s important to note that Foodee Rewards Points will only appear in your account once your order has been delivered. That means if you place an order for next Tuesday, those points will appear the same Tuesday your delivery arrives. Click on your account in the top righthand corner and then the “Rewards” section to keep track of how many total points you currently have. Once you’ve accumulated enough points, you’ll be able to redeem them for free online gift cards. To redeem them, go to your dashboard and select the amount you want to redeem. Once you’ve selected the amount, you’ll be prompted to choose which gift card you would like. You will then receive an email with the gift card code and a link to the website of the gift card you choose. Foodee Rewards Points won’t last forever, but you do have three full years to use them before they expire. And FYI, 300 Foodee Rewards Points amount to one dollar for available gift cards. Trade in 3000 Foodee Points and you’ll have yourself $10 towards an online gift card. Foodee Rewards is our way of saying thanks for your ongoing loyalty. As a Foodee Rewards member, your orders will earn you free stuff. The more you eat the more you earn. 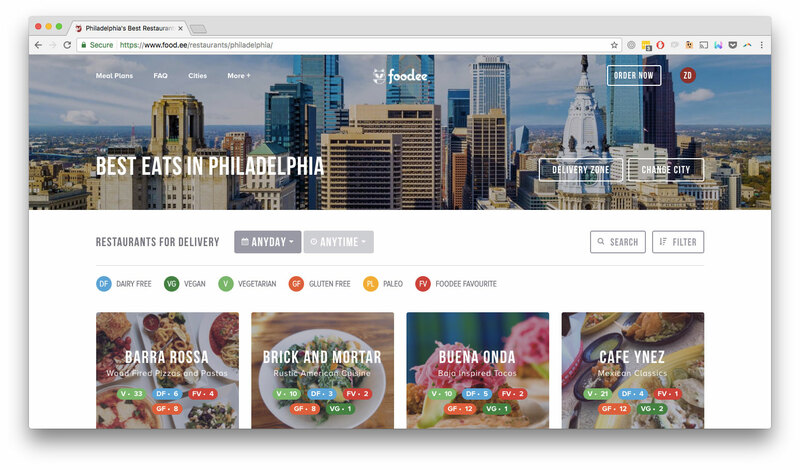 Sign up for a Foodee account to get started.